The iron screen at the end of the Privy Garden and fronting the Thames was designed by the Huguenot ironworker Jean Tijou. Tijou had arrived in England in c.1689 and enjoyed the patronage of King William and Queen Mary. He produced the screens and grilles of St. Paul’s Cathedral for Sir Christopher Wren, and also worked at country houses such as Easton Neston, Burghley and Chatsworth. At Chatsworth his surviving works include the balustrade of the upper flight of the grand staircase and the set of gates known as the Golden Gates. Tijou published his New Book of Drawings in 1693 and continued to work in England until around 1711. The gates and railings that form the Tijou Screen had been stripped and repaired on several occasions before I sampled them. However, an effort was made to locate areas of old paint that might have remained in the quirks of mouldings. No trace of gilding, either in the form of gold leaf or gold size, was found on any of the samples examined. The iron appeared to have been primed with a mix of white and red lead. Approximately ten schemes were found on the gates; the first was grey, this was followed by dark green, and more recently black had been used. The first surviving scheme, of a mix of lamp black and lead white, was a grey that was generally called iron colour or lead colour, and was a traditional treatment for ironwork in the 18th and early 19th century. 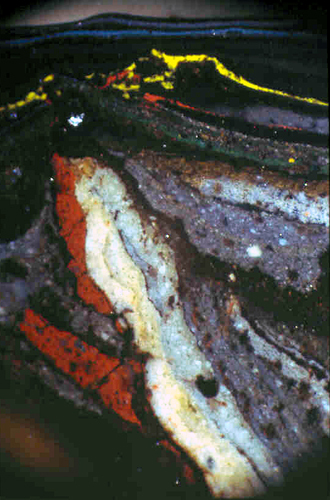 Layers of paint containing exactly the same constituents have been found elsewhere on the Tijou Screen, and on the Tijou ironwork in St Paul’s Cathedral. The next three schemes appear to have been a very dark green, again a traditional colour on ironwork, and typical of the bronze greens of the late 19th and early 20th century. 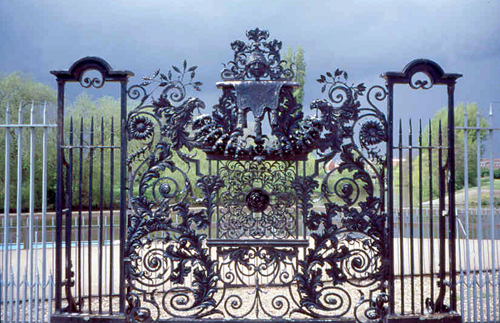 The use of black on ironwork is very much a 20th century tradition, and examination of many railings in London and other English cities and towns suggests that it dates largely from the post-War period (having nothing to do with the death of Prince Albert as the myth would have it). The first thing to become apparent when the screen was painted in the original grey colour was that it became three dimensional in appearance – each side of the vertical bars, for example, catching the light. The black had succeeded in flattening everything, as can be seen above. I was responsible for the new grey colour of the screen and the woodwork in the recreated Privy Garden. My great grandmother Emily Tijou (on my father’s side) was a 6th generation direct descendent of Jean Tijou. On a visit to Hampton Court in 2001, my wife and I enjoyed both the palace, gardens and the intricate ironwork and gates. 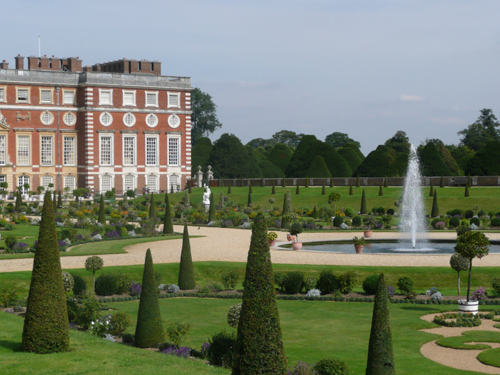 It is a pleasure to see experts such as yourself restoring these treasures and keeping british heritage alive. I am sure that you can imagine what a treat it was to be asked to look at the magnificent Tijou Screen. 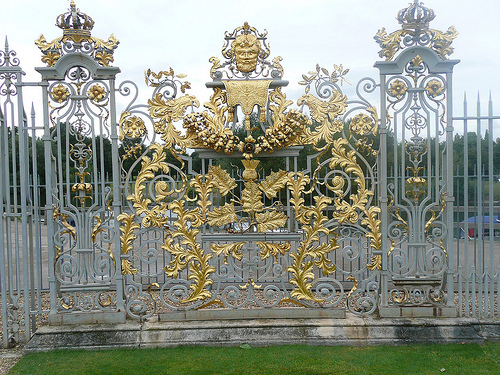 It is certainly one of the finest pieces of ironwork of the early 18th century. as a direct descendant of Jean tijou it is a pleasure to see his work being so well cared for, it makes me proud of my heritage. He is held in very high regard and I was delighted to be involved in the project.